You could, if you're feeling brave, argue that someone is as good. But better? No way. Without Winter, there's no triangle offense and Phil Jackson's Bulls and Lakers don't dominate the NBA for 12 years. The Eagles' defensive coordinator under Andy Reid since 1999, Johnson has coached the stingiest defense in the NFL over the past five years. The new Notre Dame head coach made his mark as offensive coordinator of the dynastic Pats. Also coached with the Giants (1990 Super Bowl Champs) and Jets. First under Chuck Noll and now Bill Cowher, the backfield/running backs coach consistently has had the Steelers at or near the top of NFL rushing stats. As a hitting coach for the Royals, Lau taught the book he wrote: "How to Hit .300." Just ask George Brett, who almost hit .400 with Lau's spray-hitting method. Offensive line coach extraordinaire and master of teaching the (barely) legal cut block. Now with the Falcons. The best offensive coordinator in college football for the past 32 years (including stints at BYU and USC), he's now trying his hand with the NFL's Titans. Currently under contract to the Blazers, a short list of players developed by Grgurich: Jermaine O'Neal, Gary Payton, Sebastian Telfair. After 10 years as the Mets' pitching coach (including the 1986 World Series Champs), he's survived a decade of George Steinbrenner in the Bronx, and helped build a dynasty. That's the first thing the casual baseball fan notices about him, because it's where the cameras go. A Braves pitcher is in a jam, and the director pushes the buttons to bring up the angles -- the pitcher pacing, the runners on base, the batter stepping in ... and then the dugout shot: Leo Mazzone, on the bench, rocking back and forth, back and forth. It's Mazzone's accidental trademark. He says he's rocked his whole life. Hank Aaron met Leo back in 1979, and says, "He didn't rock [then] as much as he's rocking now." But minor-league coach and long-time friend Al Gallagher says that back then, "He rocked watching TV, he rocked chewing, he rocked while he was eating." Perhaps the greatest tribute to Mazzone is that so many of his colleagues are willing to share their enthusiastic praise of him, often at great length. The only significant exception to this was Braves manager Bobby Cox, who refused repeated requests over a two-month period this summer to talk about Mazzone. Perhaps, with rumors swirling that George Steinbrenner might soon be making Mazzone an offer he can't refuse -- to replace Mel Stottlemyre as the Yankees' pitching coach -- Cox didn't want to make Mazzone look any more attractive than he already does. Others, such as his current and former pitchers, along with veteran Braves players like Chipper Jones, Schuerholz and the many people who've worked with Leo since he joined the Braves' organization in 1979, readily describe a slew of attributes that, taken one at a time, might not mean all that much. But add them all up, and you've got Leo Mazzone. And greatness. One of the things most remarked upon is Mazzone's unique throwing program. In other organizations, the standard for starting pitchers is to throw once off the mound between starts. In Atlanta, starters throw twice off the mound between starts. There are exceptions, sometimes because of injury, sometimes because of an individual pitcher's preference. The program is not dogma. John Rocker was the Braves' top closer in 1999 and 2000, and for the first two months of 2001, before being traded to Cleveland. In two-and-a half seasons with Atlanta, he saved 83 games. Greg Maddux signed with the Braves as a free agent in December 1992, after he'd won 90 games and a Cy Young Award with the Cubs. In 1993, 1994 and 1995, Maddux collected three more Cy Young Awards. He pitched for the Braves for 11 seasons, during which time he cemented his indisputable Hall-of-Fame credentials. Pete Smith made his major-league debut at age 21, in 1987, and was a Braves starter for six full seasons. Leo liked a lot of reps with low intensity. He would try to curb your intensity and your pitch number. If there was a likely scenario, for a reliever, that you'd be pitching that night, he'd give you 20 or 30 throws, tops. But if it was a day after you'd pitched two days in a row, and you were probably going to get the day off anyway, he'd give you some time to get some work in, work on some things, try to work out a few kinks. There are no parachutes on your back, no cones to run around, no 10 different meetings talking about something that doesn't concern you. All the other stuff, you don't partake in. So you spend less time doing nothing, and you spend all your time doing what it is you have to do to get better on the mound. You don't think pitchers appreciate that? Running all these drills and doing all this stuff before you get on the mound is not very bright. Your first priority is to get on the mound and practice your craft, without being fatigued from drills that are not going to mean near as much as you trying to make pitches. We'd run, but not four miles a day. We tried to make it fun. We had eight or 10 football patterns that we'd run. Until Mark Wohlers jammed his finger. That's when Schuerholz said, "We're not going to do that anymore." 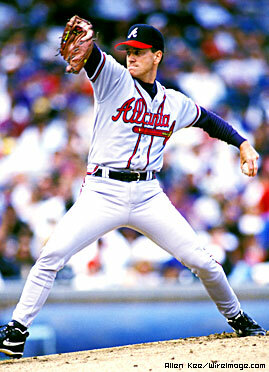 Tom Glavine made his major-league debut with the Braves on August 17, 1987. He won the Cy Young Award in 1991 and 1998, and was the World Series MVP in 1995. You get guys to throw as much as they want to, so they can develop feel on their pitches and understanding of their mechanics. In terms of getting guys to throw more often, I think a lot of people don't want to do that simply because they are scared to death somebody's going to get hurt. Coaches are going to err on the side of caution and not encourage guys to throw as much as Leo does. The throwing program is based on common sense. I don't think it's that big a deal, but you'd be amazed how people can't understand. Somebody told me one time that you can't do that because pitchers would break down late in the year. I asked him what he did. And he said that his pitchers played catch in the outfield. And I said, "Well, explain the difference between playing catch in the outfield and playing catch on a mound when you're only 60 feet, six inches from your target." He said, "Well, they had a tendency to throw too hard." I told him, "That's what the hell they pay you for, to regulate the effort." Most of the stuff that Leo teaches, he learned from Johnny Sain. Everybody has his mentor, and Sain was Leo's. During spring training in 1979, Leo started to spend time with Johnny Sain in West Palm Beach, Fla. As a pitcher for the Boston Braves, Sain had been famous as part of one of baseball's best rhymes, which summarized the Braves' starting rotation: "Spahn and Sain and pray for rain." He was one of the game's best pitchers, a three-time All-Star known for his great control and durability. Sain and Mazzone were both pitching coaches in the Braves' organization. In '79, Sain was nearing the end of his coaching career. Mazzone was just starting out. Sain was fiercely independent. He carried around books that extolled the power of positive thinking, and often quoted from them. He would give advice and suggestions, but not orders. He closely monitored how often his pitchers threw, and how hard. He disdained the idea of having the entire team meet to talk about how to get out specific hitters. Sain is still alive, but suffered a stroke several years ago. His poor health prevented him from being interviewed. The last time the Braves played the Cubs in Chicago, Mazzone visited Sain. Mary Ann Sain is Johnny's wife. Jim Bouton was a Yankees rookie in 1962 and was coached by Sain in 1962 and '63, when Bouton went 21-7 with a 2.53 ERA. Johnny was a little bit of a rebel. Whenever I heard people downgrade him or belittle him, I just laughed inside, thinking, "You people must be idiots if you don't want to listen to the man who has the most 20-game winners in the history of baseball and all the great things that he accomplished." Hank Aaron told Leo to listen to everything John had to say. Leo listened, all the way. John told him not just about pitching, but also about the mental side of how a coach deals with pitchers, their psyches. John said, "You need to be a teacher and not a dictator." I was going to pick his brain, and learn everything I could from him, because he offered everything except the usual clichés. Johnny used to say, "When you're dealing with pitchers' psyches, you go about it different ways, depending on their personalities." He was looking for someone to hand down all his pitching knowledge to. There was a whole bunch of people that were fools for not taking advantage of his knowledge. They didn't want to be open-minded about anything. In the beginning, it puzzled me; but now that I've been in the game this long, it doesn't. In the game of baseball, there are a lot of people who would rather be right and lose. Johnny's genius was that he would make you think. He would ask: "What do you think is your most important pitch? What's your second most important pitch? What's your third? How much time do you have to spend on keeping your pitches sharp?" With those questions, you'd realize you were spending 70 percent of your time on your least important pitch. It would just give you a different perspective about where you were spending your time, and why. He had this practice of not saying anything bad about a pitcher, even if you got bombed. You'd come in and throw your glove and get all upset. At some point after the game, or maybe the next day in the airplane, he'd sit next to you and he'd say: "You know, that was a hell of a curve ball you threw Norm Cash in that fourth inning there. Hell of a curve ball." He'd pick out one thing that you did well, and get you thinking about that. And he always believed in a man's dreams about himself. "Don't be afraid to climb those golden stairs." I remember him saying that in 1963. That was just sort of his general philosophy. "Don't be afraid to climb those golden stairs." Mazzone turned up for spring training in 1976, ready to begin his 10th year as a minor-league pitcher. In the previous nine seasons, he was a pedestrian 53-56 with a 3.77 ERA. His best season came in 1972 with Amarillo of the San Francisco Giants' organization, where he went 9-8 with a 2.26 ERA, striking out 119 while walking only 38 in 136 innings. In '76, Syd Thrift was the de facto GM of the Oakland A's, even though Charlie Finley officially held the title. I looked his records up and saw what he had done. I watched him in spring training. I had a team in Corpus Christi that was looking for a manager, and I thought Leo would be good. I knew very well that he had great baseball aptitude, that extra sense about how to pitch and how to play. He was a very astute judge of what was going on in the present. So I called him into my office and told him that he was a good Triple-A pitcher, but that I saw no future for him in the major leagues, and I was going to release him. He blew a gasket and called me all kinds of unusual names. I said, "When you calm down, come back, I want to talk to you about something else." I was an angry young man. I'm sure Syd felt the brunt of it, from what I called him. The thing that disturbed me most was that, in one year, I had gone from being an insurance policy to protect the left-handed relievers in the big leagues to him saying that I was coaching material. I think I was a big-league pitcher. I was with some strong organizations at the time; and when I see some of the left-handed relievers that are in the big leagues right now, I know I was a big-league pitcher. I had years where I pitched great. Seventeen complete games one year. But when I kept getting pushed back or getting passed over -- because the money wasn't invested in me -- then my temper got a hold of me a little bit. He came back the next day to apologize. He said he went home and his wife told him: "You know, I've been thinking the same thing for several years. He told you the truth." I told him I had a job for him as manager in Corpus Christi. I had to make a decision whether to take that job or accept an offer to pitch in Pawtucket, which was Triple-A. After thinking about it for a couple of days, I took the managing job. I thought that maybe I'd be caught in the same boat again the following year, only with no team to coach or manage. So I decided to make my move. The opportunity was there, and I didn't know if it would present itself again. Mazzone managed the Corpus Christi Sea Gulls of the Gulf States League for two seasons, piloting the Gulls to the championship both years. Then he moved on to the Class A Kinston Eagles of the Carolina League for the 1978 season. Tony Rigsbee has been broadcasting for Carolina minor-league teams since the 1970s and for the Durham Bulls since 1980. Leo was one of the most fiery managers you'll ever see. Extremely fiery, in the Earl Weaver mode. He loved to argue with the umpires. He was always colorful, and he would put on a show when he was ejected, throwing the bases. He was one of those guys that would give you your money's worth. In the late 1970s, minor-league baseball was just starting its revival. It was really important to do that. Hank Aaron was the Braves' vice president and director of player development from 1976 to 1989. He is now the team's senior vice president and assistant to the president. We were looking for a pitching coach at the minor-league level, and his [Mazzone's] name surfaced. He was young, so we thought we'd give him a shot. We met in Sarasota. That was the same year that the Braves had drafted Steve Bedrosian and one or two other high-profile pitchers. The thing that impressed me most about him [Mazzone] was the fact that he was so patient. He was able to help all the young kids move to another level. I worked for Hank for 12 years. He's still one of the best bosses I've ever worked for, because he said: "Leo, here are the pitchers. You take care of them." One time, I hadn't heard from him in a while, and I thought maybe something wasn't going right. So I called him up and said, "Is everything OK?" He said: "Leo, if I'm not calling you, everything's fine. If I'm calling you all the time, something isn't right." 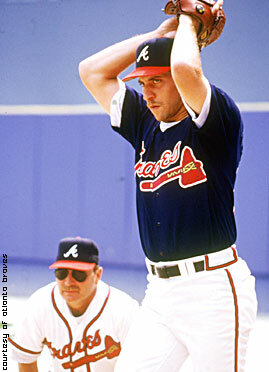 I was brought up to the Braves in 1985 to keep peace between Johnny [Sain] and [manager] Eddie Haas. It was the most humiliating, most embarrassing, most difficult year I ever spent in the game of baseball in my life. I was taught how not to treat people. I knew that I wasn't in the right place. Actually, Mazzone was in the right place, but at the wrong time and with the wrong people. After Haas was fired, the Braves were in dire straits, perennial losers without stable leadership. In 1986, Bobby Cox was hired as the Braves general manger and Mazzone was assigned to Double-A Greenville. In the late 1980s, he coached for the Triple-A Richmond Braves. There was a glimmer of hope: Some of the young guns, including Glavine, were already in the Braves' organization, and others, like Smoltz and Avery, would arrive soon. 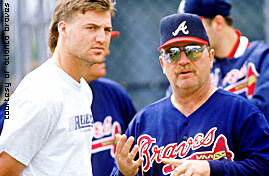 On June 21, 1990, Cox replaced Russ Nixon as the Braves' manager. The next day, Mazzone began his second stint as the pitching coach for the big-league club. Schuerholz took over the GM duties from Cox in October 1990, and has been in that position for the past 15 years. [Mazzone] was very ambitious and gung-ho. He was going to get the starting pitchers to throw twice between starts instead of one time, and to try to get the relievers to throw off the mound more often, even though they might pitch in a game that night. The biggest shock was that, here we were, doing what we've done for so many years, and all of a sudden it's, hey, we're going to throw even more than we do now. I remember it being a very foreign way of thinking. When Bobby came on the scene, [in '86] I knew I was in good shape. He was in constant contact with me. He'd talk to me about pitchers all the time, projecting future rotations for the Braves. He didn't trade all those pitching prospects for a quick fix to get them to .500. He gave me the authority to use the pitching programs in the farm system. The throwing programs made sense to Bobby. He said, "I like this, I like what I'm hearing." He made me feel important. I didn't really know Leo, so I didn't have any preconceived notions about him. I was satisfied that Bobby thought he was a good pitching coach. I knew that he was a disciple of Johnny Sain, admittedly so and outwardly so. And I didn't think that would be bad. In '88, '89 and '90, we had a bunch of guys who tried hard but didn't exactly play great defense. And then we started coming up with guys like Rafael Belliard, Terry Pendleton and Sid Bream, and guys in the outfield that could catch the ball. They made up for our mistakes, which was essential. When you've got young arms and talent in the rotation -- some other teams have proven it, too -- you start losing 2-1, 3-2, and you've got great games pitched that go unnoticed. You start trusting your mechanics more, and then everything Leo said starts working. 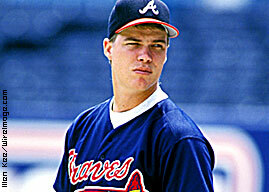 Chipper Jones was called up by the Braves in September 1993, and has played his entire career with Atlanta. The third baseman was named NL MVP in 1999 and is a five-time All-Star. Greg McMichael was a Braves reliever from 1993 to 1996. Mike Remlinger followed up an 8-15 record as a starter with the Reds in 1998 by going 25-10 as a Braves reliever over the next four seasons. Whenever I think of Leo, I think of his mound visits. One time he comes out and looks at me and goes, "Why the [bleep] didn't you come in here and talk to him? Get him settled down!" And I say, "I'm the third baseman, Leo. It's your job to be able to tell him." And we started going at it there on the mound. I think he was just kidding around, just trying to give the pitcher a blow, because he looked a little tired. You can push harder when they're going well and not when they're going bad. When they're going bad, that's when they need some support, mentally and physically. If someone's going well, and they get away with something, you make sure they know they got away -- when they're going good. And then when they're going bad, try to point out the good things that they've done. He picked his spots, when he tried to get in your face and get you going a little bit. He came out one game in San Diego, like in, I don't know, '92 or '93, and got in my face on the mound. "Are you hurt?" I said no. He said, "Well, why don't you start pitching like you're not hurt, or we'll get somebody out here who can!" It was all in an effort to try and get me to stop being defensive and go more on the attack. We were working on the side in 1994 or 1995, and he was getting frustrated with me. I was frustrated, too, and he just started ranting and cussing, and I just turned around and said: "Leo, that does nothing for me. Knock it off." He shut up. One time up in Toronto, I came out of a game, and I was pretty heated and he was pretty heated that I was pitching the way I was. We got into it from opposite ends of the dugout pretty good. When the game was over, he said, "You know what, if you didn't care enough to get that mad, then I wouldn't want you on my team." There is never a grudge with Leo. He doesn't put up with a lot of crap. There were times when Rocker would come over in a side session and throw four pitches and get pissed off and throw the resin bags up against the backstop and start cussing and carrying on. When he would do that, I'd say, "See you later." I'd walk out on him. "Hey, where you going?" I'd say: "I ain't watching you do this crap. If you want to use some common sense here and try to upgrade your pitching, then we're going to stay. But if not, forget it." Charlie Leibrandt pitched for the Royals before being traded to the Braves in December 1989. [Mazzone] doesn't get bored. He's not tired of seeing me pitch or John Smoltz pitch. You see a guy pitch 35 times, 35 starts. And it might be 70 times in between that he's throwing. That gets a little tedious. He's able to communicate what he sees and kind of get you to throw the ball like you should be throwing. A lot of pitching coaches I had weren't able to do that. They'd always say, "Nice pitch, nice pitch." That can't help me. One pitching coach I had, the relationship got so bad, I wanted to throw before he came to the park! I didn't want to hear that kind of stuff, because I knew it wasn't true. Leo would just say, "You can't get guys out with that." And we'd work on it, and we'd try to sharpen things up so that, when you go into a game, you'd have some confidence. When you go out on the mound, he may be talking to somebody else. But if you let one pitch go -- maybe your elbow was down -- he'd be right on top of you, and you'd get your elbow back up. DOWN AND AWAY, GOT IT? DOWN AND AWAY, GOT IT? Kent Mercker pitched six full seasons for the Braves, between 1990 and 1995. He was a both a reliever and, in his last two seasons in Atlanta, a starter. I think there is an understanding, whatever team you are on, whoever your pitching coach is, whoever is hitting, if you can go knee-high down and away on the corner, you are going to be successful. I don't think that's a mystery, but I think it's the fact that he stresses, he harps on it, he doesn't let you forget that. There is not a 10-minute period that goes by in a day where he doesn't say that to somebody. The best thing he has going for him, as far as a teacher of pitching, is pitch selection. He's a big stickler on pitching away to hitters, coming in for effect, basically. Not a lot of pitching coaches or managers really teach that way. And it's really kind of funny that the Braves continue to have success year-in and year-out, no matter what kind of pitchers they seem to have, and a lot of it has to do with Leo's pitch-selection philosophy. Other pitching coaches mention it -- go down and away -- but Leo, it's his brand. When you go up there and start at Leo's camp in February, the very first thing you do, from day one, is you start working on locating the outside corner. I faced Willie Green in my rookie year. In winter ball that year, I had gotten him out with inside fastballs. Faced him three times, and got him out with fastballs in. We're playing Cincinnati and Willie's up, bottom of the eighth inning or so, and he hits a home run off me. Off an inside fastball. And of course Leo's bread and butter is down-and-away, down-and-away, down-and-away. And Leo started [in on me]: "What the hell you pitching that guy in for?" And I made the stupid mistake of saying, "Hell, Leo, I got him out in winter ball with fastballs in." He lost it. "Well, this isn't goddam winter ball, is it?" And 15 minutes later, in the clubhouse, he's putting his arm around me: "Rocky, just don't get beat in, okay? Don't get beat in." I'm not telling them to throw every pitch down and away, but as long as you have that pitch, you're always going to be good. I had a coach one time say, "Leo, how do you teach guys to pitch inside?" I said, "I teach them down-and-away." He said, "What do you mean?" I said, "They can dictate, then, when they want to go in." Sain taught me that one of the worst things you can do is over-coach, especially if it's a young pitcher coming into a farm system. My feeling is you leave them alone, and you let them express themselves, and, if everything's fine, you continue to leave them alone. For example, we signed Steve Avery, a No. 1 pick. I had Steve in the minor leagues and for six, seven years in the big leagues, I never taught him one pitch. All I did was try to help him keep what he had. He controls his area. He doesn't meddle in anybody else's area. He says, "I do pitching. I'm not going to fake that I know how to get hitters out. I'm just going to teach a pitcher how to throw a pitch to an area, and that's it." You see a lot of stuff going on -- a lot of coaches want to be loud, and holler and carry on, especially if they think somebody's watching. All I'm concerned with is pitching performance from the pitcher who's starting that day. There is so much emphasis on scouting reports, like: "So-and-so is really good at hitting this pitch, he is not as good at hitting this one. Don't throw them here, make sure you get it in." Things like that. Leo's theory is that when you are on the mound, there isn't anyone that can get a hit off you. If a batter's strength is down-and-in, and that's your strength, go at him -- but don't go at him tentatively, go hard. Never sacrifice stuff to hit a location -- if you are not real good at going down-and-in, but a hitter's weakness is down-and-in, don't take a little off to try to hit that spot because that is when you get hurt. I had other pitching coaches, and we'd get there and hem and haw and go around and around in the bullpen during sessions, and they would give me paragraphs and paragraphs worth of suggestions, and I'd leave the bullpen feeling just like I did when I got there. Leo would literally say one sentence to me, I'd make the adjustment, and next thing you know, the fastball was right where I wanted it, the breaking ball was right where I wanted it. And he'd say, "Hey Rocker, I'm not just another pretty face, am I?" The Braves have a way with pitchers who seem to be washed up. They might seem to be on the decline, aging, mediocre pitchers headed toward an unnoticed retirement. Or they might be younger pitchers who got four or five years to show their stuff, and didn't show much. Often, Mazzone resurrects - or erects - their careers. Management may say: "Hey, we have a chance to get somebody. What do you think?" But my job is to take care of or try to make better pitchers out of who's on the team. And that's all I concern myself with. John Schuerholz will call me every once in awhile and mention something, but the decision is made by them. It's my job to make that decision look good. Leo and I will talk when we need to find a pitcher, because one of ours got hurt, or because someone left and signed as a free agent elsewhere. He'll say: "Well, I have a lot of confidence in you, John. I know you'll do it." And then when we bring a new pitcher in here or we bring up a young guy who's not ready yet for the major leagues to step in and fill the void, I'll say: "Well, Leo, here's your new guy. I've got a lot of confidence in you. If anybody can do it, you can." I think the one thing is there's no BS. Somebody like John Burkett will come over here, and he's like, "OK, you're pitching, you'll be pitching every fifth day no matter what, and let's go get ready to do that." He'll have the rotation mapped out for the next 30, 40 days in a row, so you're never worried about, "Oh, if I have two bad games, I'm not going to pitch on the 15th." You know you pitch on the fifth, 10th, 15th, 20th, 25th. I had one pitcher tell me, one time, "I have to get back to what I was doing last year." Well, the last year, he lost 20 games. I said, "What the [bleep] do you mean you've got to get back to what you were doing last year? You lost 20 [bleep]ing games." A statement like that, to me, makes absolutely no sense at all. The reason why he said it is he couldn't execute a very simple pitch. And after he found out that he couldn't, he said, "I can't pitch that way." That guy's never going to be any good. But there's only been one or two like that. THE FIRST HALL-OF-FAME COACH EVER? Leo just seems to have every aspect covered. He can communicate. He knows mechanics. As a pitching coach, I think he has a pretty good case for the Hall of Fame. I'd put him in the Hall of Fame. He continues to produce good pitchers, year in and year out. People always want to say, "Leo's just been blessed with good arms." I tell those people, "You don't know what you're talking about. Guys have come to him who have not had very good careers -- I could list a dozen or so -- and they get to Atlanta, and all of the sudden some journeyman has got a 2.20 ERA at the All-Star break. You go, "What's going on here?" And the only think you can really put your finger on is Leo. He's had a lot of great pitchers. One would say that he's had an easy job. I'd disagree with that. I'd say he hasn't screwed it up. He's done a great job of not screwing it up. A lot of other people could have messed it up. Personalities sometimes get in the way, but for the most part, everyone's who's been under the system -- myself, Glavine, Maddux, Charlie Liebrandt, Avery -- despite how much grief we give him personally, we all would acknowledge that he's helped us a lot in our career. What we were able to accomplish, what we were able to do? It certainly can't go unnoticed. I got a thing that I keep in my pitching book. And it says, "If you don't care who gets the credit, you'll be successful."